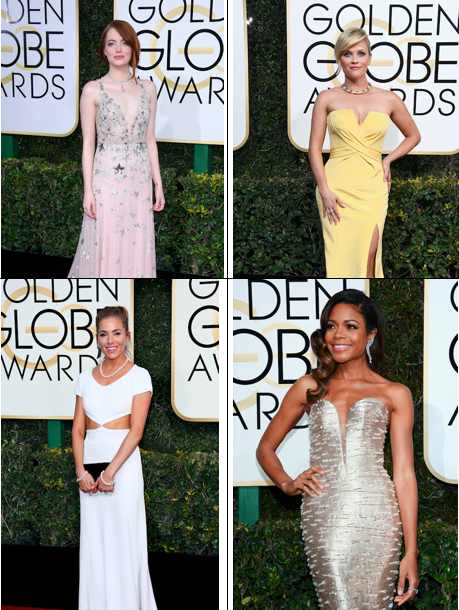 In an extremely glamorous evening that kicked off award season, we couldn’t imagine a more dazzling showing than that of the jewelry supplied to the stars by Tiffany & Co. on the red carpet at the 74th Golden Globes Awards in Los Angeles. As you likely know, the Globes, sponsored by the Hollywood Foreign Press Association is like one big party. In the smallish ballroom at the Beverly Hilton Hotel, the attendees are always dressed to the nines and ready to celebrate – much more energetic than the Oscars. Emma Stone, Best Actress winner for her performance in “La La Land”, accented her Valentino gown with a Tiffany Archival necklace and diamond earrings and rings. Natalie Portman, nominated for Best Actress for her work in “Jackie”, wore a selection of Tiffany jewels to complement her Prada dress, including diamond fringe earrings, a ring with white and yellow diamonds and a Tiffany Archival platinum and diamond bracelet. Naomie Harris, nominated for Best Supporting Actress for her performance in “Moonlight”, paired her metallic gown with diamond earrings and a selection of platinum and diamond rings. Presenter Reese Witherspoon accessorized her yellow dress with a Tiffany Archival necklace, yellow diamond earrings and a selection of rings. Presenter Sienna Miller coupled her white Michael Kors dress with classic pearls and diamond earrings. Presenter Gal Gadot complemented her Mugler gown with a diamond and black onyx necklace and ring. Host Jimmy Fallon donned a watch from the Tiffany CT60 collection in 18k rose gold. Jeremy Renner wore a Tiffany CT60 watch in stainless steel.